His Honour I. A. Roett (Chairman), Rt. Hon. O. S. Arthur, Hon. Miss M. A. Mottley and Mr. C. A. Mascoll. Hon. Dame B. A. Miller, Mr. St. C. Toppin, Mr. D. J. H. Thompson and Mr. R. D. Marshall. Mr. C. A. Mascoll, (Chairman), Mr. D. J. H. Thompson, Mr. R. D. Jones, Mr. T. A. Prescod, Hon. R. R. Farley, Dr. W. F. Duguid and Hon. K. D. Symmonds. Hon. Miss M. A Mottley: To move the passing of a Resolution to take note of the Report of the National Commission on Law and Order. Notice of this Resolution was given on 10th August, 2004. Hon. Miss. H. E. Thompson-McDowald: To move the passing of a Resolution to approve in accordance with section 5 of the Crown Lands (Vesting and Disposal) Act, Cap. 225 the lease to the Barbados National Terminal Company Limited of a parcel of land situate at Coverley, in the parish of Christ Church in this Island, for the purpose of developing a petroleum storage and terminal facility. Hon. Miss H. E. Thompson-McDowald: To move the passing of a Resolution to rescind the Resolution passed by this House on the 11th May, 2004 approving the compulsory acquisition by the Crown of the parcels of land situate at Queen Street, Speightstown in the Parish of Saint Peter in this Island for the provision of an access road to the beach. Hon. Miss. H. E. Thompson-McDowald: To move the passing of a Resolution to approve in accordance with section 5 of the Land Acquisition Act, Cap. 228 the compulsory acquisition by the Crown of the parcels of land situate at Queen Street, Speightstown in the parish of Saint Peter in this Island, for the purpose of providing an access road to preserve the traditional access of the residents and to allow vehicular access to the area particularly by emergency and service vehicles. Rt. Hon. O. S. Arthur: To move the First Reading of the Customs (Petroleum Products Bulk Storage) (Validation of Fees) Bill, 2005. Notice of this Resolution was given on 17th October 2005. Hon. R. C. Eastmond: To move the First Reading of the Occupational Pension Benefits (Miscellaneous Provisions) Bill, 2005. Rt. Hon. O. S. Arthur: To move the First Reading of the Trade, Economic and Technical Agreement (Agreement between the Caribbean Community and the Government of the Republic of Colombia) Bill, 2005. Notice of this Bill was given on 4th October, 2005. Rt. Hon. O. S. Arthur: To move the First Reading of the Free Trade Area (Agreement establishing the Free Trade Area between the Caribbean Community and the Dominican Republic) Bill, 2005. Rt. Hon. O. S. Arthur: To move the First Reading of the Trade and Economic Co-operation (Agreement between the Caribbean Community (CARICOM) and the Republic of Cuba) Bill, 2005. Rt. Hon. O. S. Arthur: To move the First Reading of the Free Trade Area (Agreement establishing the Free Trade Area between the Caribbean Community and the Government of the Republic of Costa Rica) Bill, 2005. Hon. Miss H. E. Thompson-McDowald: To move the passing of a Resolution to approve in accordance with section 5 of the Crown Lands (Vesting and Disposal) Act, Cap. 225 the vesting in the National Housing Corporation of a parcel of land situate at Fairy Valley in the parish of Christ Church in this Island for the purposes of housing development. Notice of this Resolution was given on 4th October, 2005. Hon. Miss H. E. Thompson-McDowald: To move the passing of a Resolution to approve in accordance with section 5 of the Crown Lands (Vesting and Disposal) Act, Cap. 225 the vesting in the National Housing Corporation of the parcel of land situate at Bourne's Land, St. Christopher in the parish of Christ Church in this Island for the purposes of providing a road to facilitate access to the housing development in the area. Hon. Miss H. E. Thompson-McDowald: To move the passing of a Resolution to approve in accordance with section 5 of the Crown Lands (Vesting and Disposal) Act, Cap. 225 the vesting in the National Housing Corporation of a parcel of land situate at Barbarees Hill in the parish of Saint Michael in this Island for the purpose of housing development. Hon. Ms. M. A. Mottley: To move the Second Reading of the Coroners (Amendment) Bill, 2005. The Bill first appeared in the Official Gazette on 17th October 2005. Rt. Hon. O. S. Arthur: To move the passing of a Resolution to note and approve Protocol Five of the Social Partnership, 2005-2007. Notice of this Resolution was given on 11th October 2005. Hon. 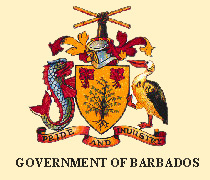 Miss H. E. Thompson-McDowald: To move the passing of a Resolution to approve the grant of a lease under Section 5 of the Cown Lands (Vesting and Disposal) Act, Cap.225 to the Trustees of Barbados Rugby Union of the parcel of land , property the Crown, situate at the Garrison in the parish of Saint Michael in this Land. Hon. R. C. Eastmond: To move that the House resolve itself into Committee of Supply to consider the grant of sums of money for the service of this Island. (a) Hon. R. C. Eastmond: To move the passing of a Resolution to grant the sum of $76,435. from the Consolidated Fund and to place it at the disposal of the Government to Supplement the Estimates 2005 - 2006 as shown in the Supplementary Estimates No. 5 2005 - 2006 which form the Schedule to the Resolution. Notice of this Resolution was given on 21st October, 2005.